4.0 颗星，最多 5 颗星Maths as art for the practical mind. I read a lot of math books, ranging from expensive obscure textbooks for PhD students infested with proofs to books accessible to my prodigious 6 yr old. This book is a well written inquisitive cave exploration to mathematical beauty, to two dimensional drawings drawn in a grammerless language that at once dance and create art through Stewart's eloquent narrative. Most of the equations (e.g. Schrodenger's equation) are given concise but deep perspectives on their weight as historical treasure and beauty while being grounded in incessant relentless practical application. A few begged for more careful and thoughtful elaboration (e.g. Chaos theory), but these were in the minority. The book is accessible without being insulting to the open minded. A great read that illustrates the beauty of something few think beautiful, and hints of the massive influence on everything that is not obvious by obviously brilliant discoveries of revolutionary accidental polymaths. 5.0 颗星，最多 5 颗星One to Read and Read Again. This is one of those well written books that will be of interest to scientists, mathematicians, engineers, physicists and others who enjoy expanding their understanding of our physical universe. It has been many years since I studied and used university level math and science, so a deep understanding of the 17 equations in their mathematical forms was beyond my remaining knowledge skills. Fortunately, the well written chapters after introducing the equations were a joy to read and led to much understanding. I fully intend to come around and go through it again later this year or next so I can grasp more. More than likely, I'll not be able to appreciate the deep meaning of the equations, but the chapter material is so full of material to savor and ponder that the second (or third) time going through the book will be a joy to repeat. Ian Stewart is a master of writing mathematics that can be understood. 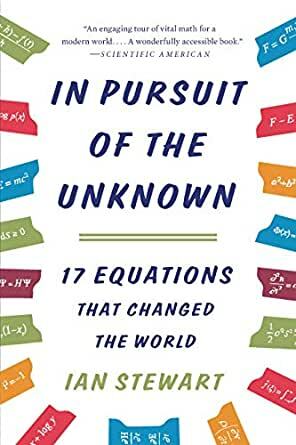 This latest addition to his literature brings to the casual reader 17 of the equations the author believes have changed the world. Some will be known to almost all and some are more embedded in everyday use rather than everyday knowledge. But the authors ability to describe the equations, history and importance follows in each of his chapters. The equations covered starts with Pythagoras's Theorom, then discusses logarithms, the limit equation in calculus, newtons gravity, the properties of i, eulers formula for topology, the normal distribution, the wave equation, the fourier transform, navier-stokes, maxwell's equations, the second law of thermodynamics, E=MC^2, schrodingers equation, shannon's theorem in information theory, basic chaos from dynamical systems and the black and scholes equations. From the first chapter the author brings illumination to his topics combining intuition with his insight. For example in Pythagoras's Theorem, the author discusses its properties, how it was interpreted (as relation of areas, as relation of triange etc) to what it tells us about geometry. Most of us are familiar with the equation but some subtle but very important details are provided and pondered- with a result that creates a certain awe. The book is filled with insight and description that can be understood by the casual reader. This is not a math book, some of the chapters have some relatively sophisticated mathematical ideas, but they are peripheral rather than core to the chapter. The book gives a sense of history and describes much of the pratical significance of the math the author introduces. I highly recommend this to all interested in how math affects the real world in application as well as to those just interested in the history some of our most important equations. 4.0 颗星，最多 5 颗星This is a good book, which should be required reading for serious math students and teachers. Professor Stewart selected 17 equations that changed the world. He discusses each equation in an engaging and practical manner, and he gives a number of illustrations of how those equations have and are impacting our lives. One could argue whether these 17 equations completely describe our civilization, or whether all should be included (unless you happen to work or be interested in special areas, such as communications or signal processing - in which case, those equations governing propagation and information theory are of major importance.) Indeed, the author frequently points out that the equations are not independent, but richly interrelated . One can not argue that Professor Stewart doesn't give thoughtful discussions of the development and meaning of each equation. He presents many detailed references and side stories of how the equations were developed, the "blind alleys" pursued, those who opposed or aided in their development, and the time periods involved. Indeed, the author gives sufficient historical detail to satisfy ordinary history "buffs". These humanity references, together with treatment of the mathematic principles, ensures well rounded satisfaction to the reader. I do not recommend one speed-read this book, but rather cover one equation at a sitting while reading in a contemplative manner. Professor Stewart gives ample reasons for anticipation of future improvements or changes in mathematical descriptions of the world(s) in which we live. For example, he challenges the reader with the exciting possibility of how dark matter may change our understanding of the universe: he does this best in the final chapter, "Where Next?" The potential for string theory, general universal theory, and the Higgs Boson creates an atmosphere of anticipation and the need to learn more - that is a major credit to the author! Structurally speaking, this book is constructed so that each equation or chapter is virtually independent of the preceding chapter. This is very convenient, allowing the reader to select which equation to study, without the necessity of thumbing back to prior chapters to clarify some reference. I had one surprising disappointment on accuracy or proof reading, when the author, on page 40, states that the note, middle C, is 440 cycles per second. This dismayed me, because it made me doubt many other bits of referenced information, which makes this book so interesting. This mistake was not repeated in the chapter on wave motion - which restored my confidence and caused me to forgive this one error, however blatant. All in all, this is a commendable book, one which spurs the imagination, and increases the understanding of mathematical equations. I recommend this book to all students of mathematics and those responsible for teaching the subject to others.